Week 10 is done yet I still cannot believe I have been training for over 2 months! I officially now have more weeks behind me than ahead of me. I’m not gonna lie, that scares me a little bit! This was my second time incorporating a race into a long run and it went pretty well! Yoga and a LOT of stretching, foam rolling and PT exercises. My legs were so sore from RnRPhilly weekend. 60 minute Boot Camp Class. The class focused a lot on legs so it was a little rough for me, lol. This was such a busy day – work, ART appointment, 6 mile tempo run, shower and change, and then off to celebrate my friend’s birthday! But like I mentioned earlier this week, you have to maintain a social life while marathon training! 5 miles. Fridays are usually my rest days but since my long run is on Sunday this week, I switched a few things around. St. Jude Walk/Run to end Childhood Cancer. I walked this race to keep my legs fresh for Sunday’s long run. I was pretty exhausted this week but I think that’s normal, right? I knew that this phase of training would be the most difficult so I’m not surprised about how I feel. My long run this week went pretty well. I ran two miles before the race, completed the race, and then ran 6 miles. It wasn’t easy by any means but I was happy with the pace and I got it done. After I got home and showered, I was relaxing and all of a suffer I got the CHARLIE HORSE FROM HELL!! It was SO painful and it was weird because it happened a few hours after I finished running. I guess that means that I didn’t take in enough electrolytes during my run so that is something to work on for next week’s 20 miler. One more thing, check out this sale from Pro Compression on their marathon elite socks! I LOVE these socks because of the extra padding in the foot and they work great for long runs. Use code ELITE to save 42% off these socks, but hurry as the sale ends today (9/25)! I’m also Linking Up with the Jess’s (Jess Runs Atlanta and Jess @ The Right Fits) for their new link up for training recaps! A 10 mile race along with a 5k walk and all the other stuff you did this week, yea, I’d say you are right to feel exhausted! I had an epic nap yesterday followed by about 9 hours of sleep so I’m feeling much better now! All that racing and a busy week- of course you’re tired! Marathon training is cumulative and so is the fatigue- sometimes it really catches up to you. Love Pro Compression and 42% is a killer deal! Great week, thanks for joining the link-up! As I was writing my week recap I was like of course I’m tired, lol! I’m hoping to get some energy back this week! Thanks Marcia! The last 6 miles were a struggle but I took it easy and took walk breaks when needed. I’m still working on the whole mental aspect of marathon training but yesterday went pretty well so I have hope! I’m tired just reading about your mileage! LOL! Looks like you had a great week! LOL The sad part is that this week is even more miles! I am ALSO tired reading your mileage LOL girl that is so crazy about the charlie horse! this things our bodies go through post long run. I’m doing 18 next week and I’ve decided to smush a half marathon in there as well. I feel like the race gives me more motivation to keep going versus slacking off by myself. 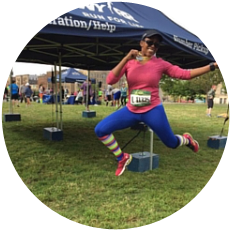 I agree – the races help me get the miles completed in a fun way, much better than running alone! I’m doing a half marathon on Sunday as part of my 20 miler – lord help me! Great job doing 6 miles AFTER a 10-mile race! That would be tough! Thanks so much – That was the hardest part of the run for me! Your pretty right to be looking forward to the cut back weeks at this point. That is why the hard work comes now and the marathon is just the icing on your cake. I sure hope so! I’m stillf eeling pretty tired this week but I know I have another high mileage week so I’m trying to get it together! OOOhhh…I hate when those cramps hit you later in the day. Have you ever had an inner thigh cramp? OMG. It’s got to feel good to be on the downhill side of marathon training. You had impressive mileage this week, including the 18 mixed in with the 10 mile race. I’ve never attempted that. Good luck next weekend on the 20 miles! Thanks for linking, Kim. Oh that charlie horse was SO painful!! It was a good minute of me screaming and trying to knead it out with my hands. The area is still sore two days later. This weekend ‘ll be sure to take in enough electrolytes so that I don’t have to deal with that again, hopefully! Thanks so much for hosting the linkup! I love linking up each week! I lol’d at your comment about maintaining a social life still marathon training! I can so relate, although mine was more of a family life. ok cater to your husband life. There were times I had to choose for sure. Great job on getting in your training miles along with a race! That is always hard to do! It’s a challenge to maintain any kind of normalcy when marathon training, but its necessary so that we don’t go too crazy!! Thanks agin for hosting this link up – I’ve found so many new blogs to follow! Great job!! It’s crazy how our races are getting closer and closer! RNR Philly was such a doozy, I needed to recover from that one for a couple of days! I know! I cannot believe that I’m almost at taper – it makes me nervous!! I think the Pro Compression sale is over now but they will be running another one soon! Wow, I’m tired reading this! Way to go. I’m so impressed at how you’ve been able to incorporate races into your training. I hate running miles before and after races! Thanks so much Jess! You are doing an awesome job as well and I’ was so impressed by your long run this weekend! That’s good to hear Courtney!